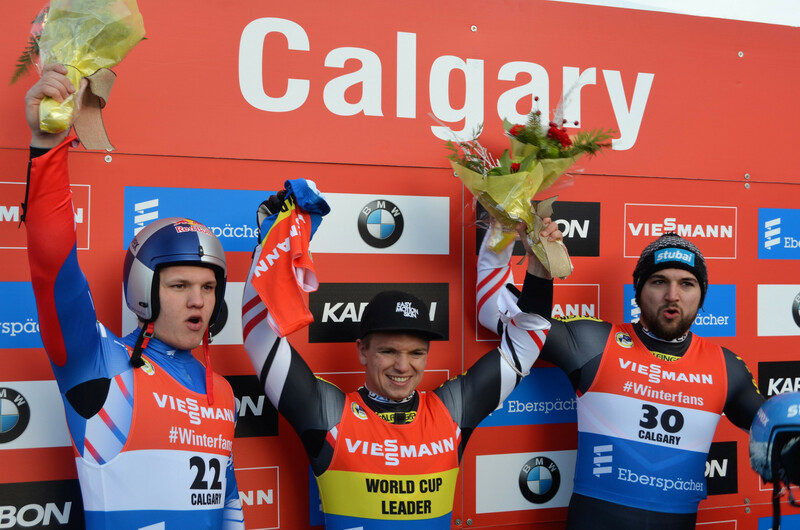 The Austrian, a double world champion, clocked 1min 29.249sec at the Canada Olympic Park to add to his singles victory in Vancouver last time out and his sprint success at the season-opener on home ice in Innsbruck. It means he has already opened up a gap of more than 100 points at the top of the World Cup standings. "I have been doing pretty well all week," said Kindl. "The competition within the Austrian team definitely contributes to our strong performance. "Competition is what keeps us thriving." Russia's Roman Repilov finished in second after missing the Vancouver leg last weekend due to visa problems. He stopped the clock at 1:29.315 after his two runs. Another Austrian bagged bronze as Olympic champion David Gleirscher clinched his first podium finish of the season in 1:29.370. Defending overall World Cup champion Felix Loch of Germany recovered from a poor first run to finish fourth. The German, a three-time Olympic gold medallist, was only 13th quickest first up but then produced the best time of 1:29.399 on his second attempt. It means Loch is joint-second on the overall leaderboard on 265 points, behind Kindl's 370. Germany's Johannes Ludwig, winner of the singles opener in Innsbruck, also sits on 265 points. The doubles event saw a first gold of the season for back-to-back Olympic champions Tobias Wendl and Tobias Arlt. They finished in 1:27.489 to add to two bronze medals from earlier in the campaign. Fellow Germans Toni Eggert and Sascha Benecken, the defending World Cup champions, could not record consecutive victories as they came second in 1:27.580. Austrians Thomas Steu and Lorenz Koller, the winners of the first two legs of the season, came third in 1:27.761. They continue to lead the World Cup standings with 330 points, just five more than Eggert and Benecken. Wendl and Arlt are third on 286. The women's and team relay events are due to conclude the Calgary World Cup in the 1988 Olympic host city tomorrow.